This has been a stand-by, go-to recipe for me for about the past year. I don’t eat cake all that often, so I haven’t made it a ton of times, but it has served me well. It’s easy enough, too, that there’s simply no excuse for a store-bought cake anymore (as is becoming the case with many other things — more on that later). I’ve laid out the tools as well as the ingredients because I find it saves time to get out what you have ahead of time and to find a substitute if needed (for tools or ingredients) before you start. Of course pretty much all the tools can be replaced with a different tool or whatever you have handy. This is just the list that I find makes doing the recipe the easiest. As always, T = Tablespoon, and t = teaspoon. 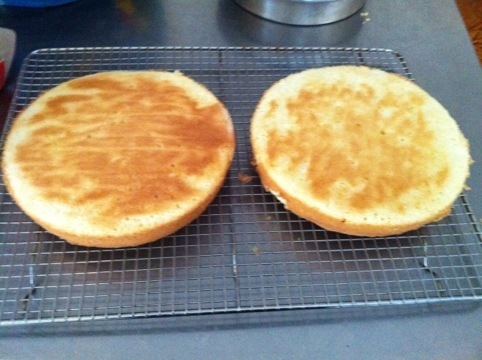 I use this recipe to make a double layer cake, using two 8 inch round cake pans. You could also double it for a nice four-layer cake. The recipe is adopted/adapted from http://www.joyofbaking.com. It’s a simple, basic, everyday-cake kind of recipe. It’s not a super tall cake but it’s versatile in terms of using frosting or ganache, or sprucing it up with cocoa nibs and a layer of homemade whipped cream in the middle. Today, we’ll be having a basic pink cream cheese frosting, and sliced strawberries topped with whipped cream for the layer. We might go crazy and even dab some nibs here and there. Let me know if you try this and have any recommendations of your own. 1/2 c. (1 stick) butter, room temp. With the eggs still cold, separate the whites from the yolks, placing each of the yolks in its own ramekin, and the whites in a third ramekin. Cover each ramekin tightly with plastic wrap, and set aside. Set a cake pan (bottom down) on a large sheet of parchment paper. Using a pencil, trace around the cake pan. Using kitchen scissors (I keep a pair of kitchen shears separate from the others for use with anything food related), cut out the round tracing, following the inside of the pencil mark. Repeat. Butter and flour the cake pans. Place the parchment paper at the bottom of each. Grease the sides and bottoms of the pans using the little bit of butter, then sprinkle flour lightly over the bottom of the pan, and tap the side of the pan to distribute. Place a parchment paper round in the bottom of each of the pans. Grease and flour the parchment paper with the same technique. Set the pans aside. REAL TIME CLEAN UP: You are now done with the greasing butter, the flour, the parchment paper, the pencil, and the kitchen shears. Sift the cake flour (1 3/4 C.) into a large mixing bowl. Whisk in the salt (1/4 t.) and baking powder (2 t.). Make sure the sides of the bowl are clean. Set aside. REAL TIME CLEAN UP: You are now done with the flour, salt, baking powder, 1 c. measuring cup, and 1/4 t., and you can rinse the 1 t. measuring spoons. Get the stand mixer ready with the paddle attachment and a clean (wiped-dry bowl). (Always remember to wipe out any equipment that you use – bowls, machines, etc., since dust and stray tiny gobbledeegook finds its way to machinery at rest). In the bowl, beat the room-temperature butter on medium to high speed until soft (1-2 mins.). Add 3/4 c. sugar and beat until light and fluffy (it will not look perfectly smooth — you will still see some graininess and that’s okay) (2-3 mins). Add the egg yolks, one at a time. Make sure the scrape down the sides of the bowl throughout the process, to ensure everything is getting mixed together. Add the vanilla extract (1 t.), and beat until combined. This whole process will take about 3-4 minutes, but just watch the butter mixture and finish wen it’s light and fluffy and looks like yummy frosting (but is not). REAL TIME CLEAN UP: You are done with the vanilla, and the egg yolk ramekins, and the 1 t. measuring spoon. Turn the mixer down to low, and add the flour mixture alternately with the milk in about three turns, with the flour being the first and last addition. I use a 1/3 c. measuring cup to scoop in the flour (using generous portions of 1/3 c.). Again, make sure to scrape down the bowl as necessary and brush off the top of the paddle any flour or other ingredient that wants to hang out up there. Keep the counter and area surrounding your stand mixer wiped down and clean. REAL TIME CLEAN UP: You are now done with the milk, flour, and measuring cups. Using a new/clean bowl for your stand mixer (I only have one bowl so I have to transfer the batter into a clean bowl, and wash out the stand mixer bowl to reuse), and the wire whisk attachment, beat the egg whites until foamy. Add the cream of tartar (1/8 t.). REAL TIME CLEAN UP: You are now done with the cream of tartar, and all measuring spoons. Keep beating the egg whites until the mixture reaches the consistency that you can form soft peaks with a spoon or spatula. Slowly add the remaining 1/4 c. of sugar and continue to beat until stiff peaks form. This may take awhile. Be patient. It matters. Remember to scrape down your bowl. When the egg white mixture reaches stiff peak consistency (enough that you could turn the bowl upside down and nothing would fall out), fold in a small amount (roughly about a half-cup) into the batter mixture, just to lighten it. In about 2-3 more scoopfuls, fold in the remaining egg white mixture. Do not mix it. Just fold it in. However, it should be folded in enough that you don’t see any egg white. (I made the mistake of not folding it in enough once, and the egg white inflated into a huge bubble in the oven, separating from the batter itself. Big mistake. But if you mix it in, the batter will deflate as well). Divide the batter evenly between the two pans and smooth the tops with a spatula or back of a spoon. Bake in the preheated oven for about 20-25 minutes (until a toothpick fully inserted comes out clean). Cool the cake pans on a wire rack for about ten minutes. Place another wire rack over the tops and turn it upside down, lifting the cake pan off the cake, one at a time. Once the pans are fully cooled, wrap them in plastic wrap and place them in the freezer for at least an hour before frosting. When ready, frost your cake and enjoy! You forgot a few things in that recipe. I didn’t see any BHA, BHT, abcdefg- red dye 3, MSG, nor a few IU of vitamin D.
Amazing the stuff they put into commercial products.